The Vivo NEX S is launching in India on July 19. The company had sent out invites to the press for the launch event set to happen on that day. Now, MySmartPrice has discovered the pricing details for the phone on Amazon's website. The phone will be priced at INR 48,990 ($716). There will likely be two variants, 128GB and 256GB and the aforementioned price is for the lowest variant. There will be also be some launch day offers. The price is significantly lower than the Oppo Find X that was announced in India today. The two phones are similarly equipped, although the Find X has a much more elaborate motorized slider system that includes both the front and rear cameras. The NEX S, in comparison, has a smaller motorized module for just the front camera. Both phones are, however, significantly more expensive than the OnePlus 6, which has similar hardware specifications but no fancy sliding cameras. 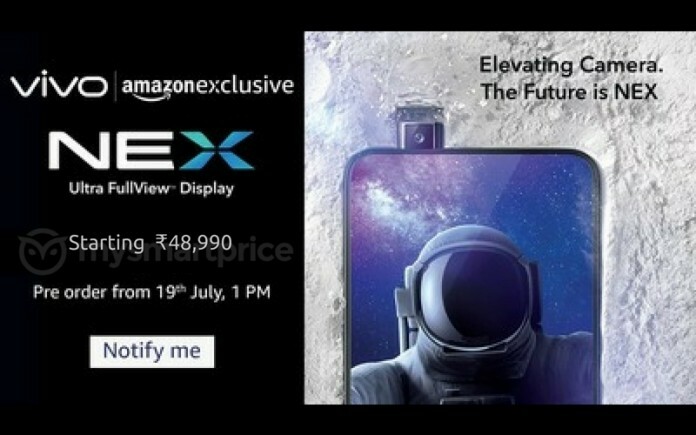 The NEX S, expected to be called just NEX in India, will be up for pre-order on July 19 exclusively on Amazon at 1:00PM IST.